On this Scotland tour you’ll get an introduction to this enchanting country, starting with a guided tour of a whisky distillery north of Glasgow and ending in fascinating Edinburgh. In between, you’ll experience some of Scotland’s most scenic areas and fascinating sights. Stunning scenery awaits you on this tour. You’ll follow the “Road to the Isles,” with its breathtaking hills, green woodlands, and spectacular beaches. You’ll overnight on the Isle of Skye, with some of Scotland’s most spectacular scenery, and drive through Cairngorms National Park, with its sub-arctic mountains and varied wildlife. Be on the lookout for the mysterious Loch Ness monster in the Highlands, and take photos of stunning Loch Lomond. Learn about Scotland’s fascinating history and visit some of the famous battle sights, including the Bannockburn Visitor Centre, commemorating one of Scotland’s most notable battles in 1314, and the Culloden Visitor Centre, where you’ll learn about the battle in 1746 when Bonnie Prince Charles was defeated. For those wanting to follow in the footsteps of royalty, this Scotland tour offers Edinburgh Castle, dating to the 12th century, once residence of Scottish monarchs, and today home to the Scottish Crown Jewels. You’ll also board and tour the Royal Yacht Britannia, home to Her Majesty the Queen and the Royal Family for over 40 years. This is just one of the out-of-the-ordinary, fascinating experiences offered on this fun-filled, exciting Scotland vacation. Welcome to Glasgow! Check into your hotel. The rest of the day is free for you to relax in Scotland’s largest city. At 6 pm, meet your Tour Director and traveling companions for a welcome dinner with wine at your hotel. Start your day with a guided tour of a WHISKY DISTILLERY, where you hear about the ancient art of converting barley, water, and yeast into a heart-warming liquor. Next, visit STIRLING CASTLE, a great symbol of Scottish independence and favored residence of Scotland’s kings and queens. Today’s final highlight is the BANNOCKBURN VISITOR CENTRE, commemorating the key battle in the Scottish Wars of Independence of June 23-24, 1314. Back in vibrant Glasgow, an orientation drive takes in the fine 12th-century cathedral, imposing university buildings, and elegant Georgian squares built by wealthy tobacco barons. Drive along the “Bonnie Banks” of Loch Lomond, then proceed via Rannoch Moor, scenic Glen Coe, and Fort William, and follow the “Road to the Isles” to Glenfinnan. At Mallaig, board your FERRY for the crossing to the Isle of Skye, the largest island of the Inner Hebrides and famous for its dramatic landscapes. Before dinner tonight, why not join an optional excursion to the spectacular Eilean Donan Castle, followed by a drink at a local pub? Return to the mainland this morning and trace the shores of Loch Ness on your way to the CULLODEN VISITOR CENTRE, where you hear the story of the crushing Hanoverian victory over Bonnie Prince Charlie’s Scottish clans. Then, a unique treat: admire a champion shepherd at Leault Farm as he manipulates his flock with up to eight border collies in a SHEEPDOG DISPLAY. Enjoy more spectacular Highland scenery as you drive through Cairngorms National Park and Glen Garry to the Victorian mountain resort of Pitlochry and then to your overnight destination: Dunkeld. Look forward to a special visit to SCONE PALACE, the stately home of the Earl and Countess of Mansfield. 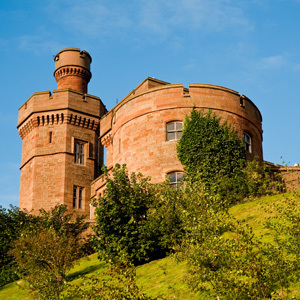 Join your guide on a private tour of the Murray family home and hear about the crowning of Scottish kings, including Macbeth and Robert the Bruce, then enjoy COFFEE and SHORTBREAD. Plenty of time later to explore the palace grounds. Continue on to St. Andrews, whose Royal and Ancient Golf Club, founded in 1754, has given us the rules of golfing. A fun inclusion is the opportunity to hit a few balls at the ST. ANDREWS GOLF PRACTICE CENTRE. Cross the mighty Forth Road Bridge to Edinburgh and tonight, don’t miss our optional Scottish evening with Highland dancers, bagpipers, and the Ceremony of the Haggis. Morning city sightseeing with a Local Guide introduces you to the 200-year-old “New Town” and famous scientists, inventors, and novelists who lived there. In the “Old Town,” drive up the narrow Royal Mile to EDINBURGH CASTLE to admire Scotland’s Crown Jewels. The afternoon is free to enjoy the Scottish capital at your own pace. Later, a unique experience: board the former Royal Yacht Britannia, once the perfect royal residence for glittering state visits and family holidays. Tour five decks and see how the Royal Family and crew of 240 lived and worked on board. Dinner rounds off this exceptional evening. For departures August 4, August 11 and August 18, tickets are included for tonight’s performance of the world-renowned MILITARY TATTOO, a vast spectacle of massed Scottish pipe bands that takes place in an arena on the esplanade of Edinburgh Castle. Thistle Glasgow is a luxury hotel in Glasgow City Centre. It is ideally located for the Central Train Station and for all the sights and special events that make Glasgow so unique. The Thistle Glasgow hotel is within a short distance of the fashionable boutiques and restaurants of Princes Square, the roar of Hampden Park for football or music events and the ‘Armadillo’ for concerts. The Dunollie Hotel is set by the serene waterside of Broadford Bay, at the foot of the mountains that lead to the famous Cuillin Hills. With 84 en suite bedrooms, a bar and restaurant, it is perfectly placed to explore an area rich in history. Discover a highland escape at Hilton Dunkeld House. Once the summer residence of the Dukes of Atholl, the hotel is idyllically set on the banks of the River Tay in the heart of Perthshire’s Big Tree Country. The Garden Restaurant has Scottish specialty dishes prepared using the freshest local ingredients and overlooks the River Tay. Enjoy a single-malt in the Garden Bar or relax in the cozy atmosphere of the River Lounge with a light lunch or aromatic coffee. A fine 3 star Edinburgh hotel, ideally located in the city center’s popular Princes Street. Mercure Edinburgh City Princes Street Hotel has great views of Edinburgh Castle. The 158 stylish rooms all have internet access and satellite TV. PrincesDining Room and Bar are open for breakfast, lunch and dinner, as well as for light snacks and drinks. Eilean Donan Castle and Pub Visit One of the most iconic images of Scotland, Eilean Donan castle is situated on an island at the point where three great sea lochs meet. First inhabited around the 6th century, it has 800 years of history of the Clan Macrae within its walls. You have the opportunity to explore the castle at your own pace and to capture it on your camera from all possible angles. Later, discuss your impressions over a drink at a local inn.